Since the government can't find a solution, communities are coming together. Some government workers who are not getting paid are finding ways to help themselves out financially while their paychecks aren't coming in the mail, but others are finding some unexpected kindness from their neighbors. While there doesn't appear to be a political solution to the shutdown coming in the immediate future, the community-based solutions are helping in the meantime. Here is a roundup of some ways that neighbors and community leaders are chipping in to help those who have been furloughed in the ongoing government shutdown. (WFAA) Federal workers who attend the Concord Church in Dallas were given $100 Walmart gift cards during the morning service on Jan. 13, 2019. 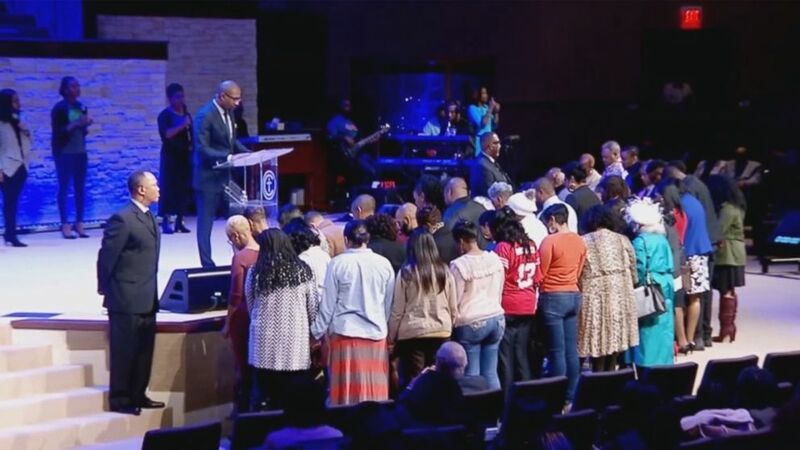 A pastor in Dallas called those impacted by the federal shutdown to come up to the altar at The Concord Church during a service on Sunday Jan. 13, ABC affiliate WFAA reported. In addition to the prayer, the pastor also announced that they'd each be getting a $100 Walmart gift card. "When our community hurts, we hurt," Pastor Bryan Carter told WFAA. "We believe it's important to stand up and serve during this difficult season." Carter also told WFAA that some of the families would be getting a food basket as well, if needed. The men and women working at federal prisons are some of the tens of thousands who aren't getting paid during the longest government shutdown ever, and so one woman in Minnesota whose husband works at such a prison took action. Caitlin Matera told ABC affiliate KAAL-TV that her husband works at the Rochester Federal Medical Center, and that she helped organize a food drive for impacted federal prison employees. "The worry is that we don't have income coming in and there are bills that still need to get paid," Matera told KAAL-TV. "We need to try to offset. If I can not spend $40 at a grocery store I can pay at least a partial heat bill." "It's so overwhelming," she said. "I'm so filled with love and hope for everyone who is turning out for families like mine." (WVII) Air traffic control workers and TSA workers in Maine can get a deal on their meals at Moe's Original BBQ in Bangor during the shutdown. 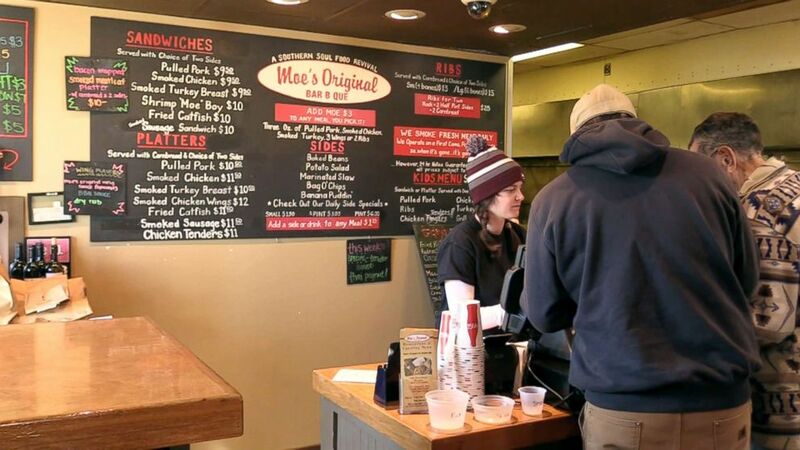 Air traffic control workers and Transportation Security Administration (TSA) workers in Maine can get a deal on their meals at Moe's Original BBQ in Bangor, Maine, because the owner wanted to help out the furloughed workers. "We all know how it is to go paycheck to paycheck, and when you don't have a paycheck that can be a little bit tight," owner Dewey Hasbrouck told ABC's affiliate in Bangor, ABC 7. "We get it and we're just trying to do our part," Hasbrouck said. The discount means that impacted air traffic controllers and TSA workers can get any sandwich meal or platter -- which normally cost between $9.50 and $15 -- for only $3. 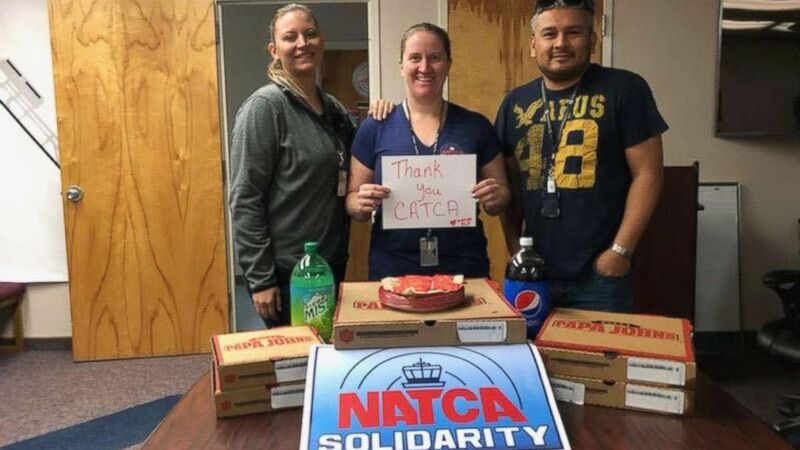 (Courtesy of the Canadian Air Traffic Control Association) Air traffic controllers in El Paso, Texas were sent pizzas from their Canadian counterparts as part of a show of solidarity amid the ongoing U.S. government shutdown. As a show of solidarity, a number of air traffic controllers in Canada have banded together to get meals for their American counterparts amid the ongoing government shutdown. The grassroots effort started on Thursday, according to Peter Duffey, the president and CEO of the Canadian Air Traffic Control Association. "It was a natural thing to send it to the people we work with on a daily basis, [but] we got through that fairly quickly," Duffey said. From there, the generosity spread to other air traffic control centers across the U.S., picking other places where they had connections. As of midday Monday, Duffey said over 400 pizzas have been sent to 52 different air traffic control facilities in the U.S. -- "and that number just keeps growing." "It was a natural thing for them to do. They wanted to show support," Duffey said. Given the unknown duration of this event, we’re working diligently to plan and implement relief efforts aimed at helping those affected families and individuals throughout Florida. In Florida, Tampa International Airport has partnered with volunteer groups like Feeding Tampa Bay to help set up a food bank for TSA and customs employees there. "It's a guessing game on how much we'll need," Feeding Tampa Bay spokesperson Jayci Peters told ABC affiliate WFTS. "We're be able to start to understand how many employees are using it each day so that we can make sure we're able to restock." The food bank is being set up at the airport, where WFTS reports that there are about 700 federal employees. Similarly, Florida-based non-profit Farm Share is helping provide a week's worth or more of food for impacted workers in Tallahassee. "Given the unknown duration of this event, we’re working diligently to plan and implement relief efforts aimed at helping those affected families and individuals throughout Florida," Farm Share Chief Operation Officer Stephen Shelley said, according to ABC affiliate WTXL. Food for family members -- both human and animal -- are among the priorities of generous donors in Chicago who are trying to help out furloughed workers. 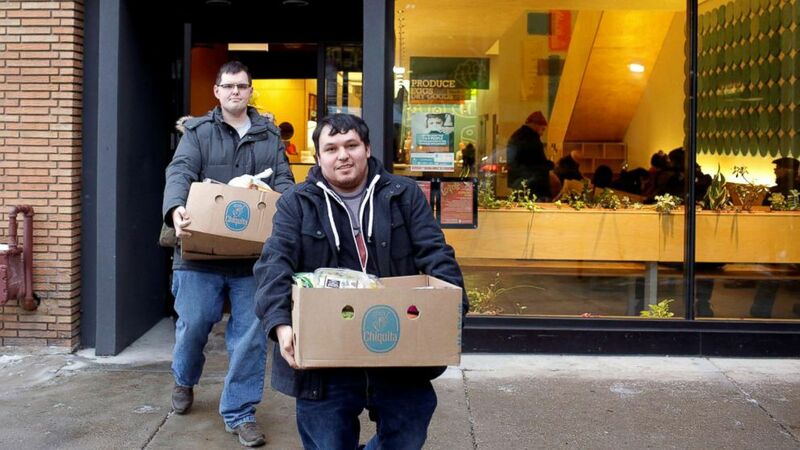 Lakeview Patnry is offering two weeks' worth of groceries for impacted federal workers and the Anti-Cruelty Society in River North is giving away free pet food and supplies, reports ABC station WLS. "People have a lot of obligations in their life and if they are struggling to meet their rent and their monthly bills, it may be very difficult for them to find extra income for things like pet food," David Dinger, the acting president of the Anti-Cruelty Society, told WLS. Baltimore mayor Catherine Pugh announced that federal workers who have been furloughed can get a waiver for their water bills during the shutdown, reports ABC affiliate WMAR. The adjustment will create payment plans that allow furloughed employees to put off paying their water bills until they get their paychecks when the shutdown is over. "DPW stands for public service, and the public servants who are going without an income deserve our consideration," said Rudolph Chow, the director of the Department of Public works, according to WMAR. Pugh has also called for mortgage lenders, creditors and utility providers to come up with ways to help as well. People have a lot of obligations in their life and if they are struggling to meet their rent and their monthly bills, it may be very difficult for them to find extra income for things like pet food. In an effort to clean up their national park while workers are furloughed, a group of Libertarians in Shiloh, Tennessee, is working to keep the Shiloh National Military Park clean. "A lot of the grounds have not been kept up the way that it usually is so we are out here to volunteer and help pick up garbage," Paige Lee told ABC affiliate WBBJ. 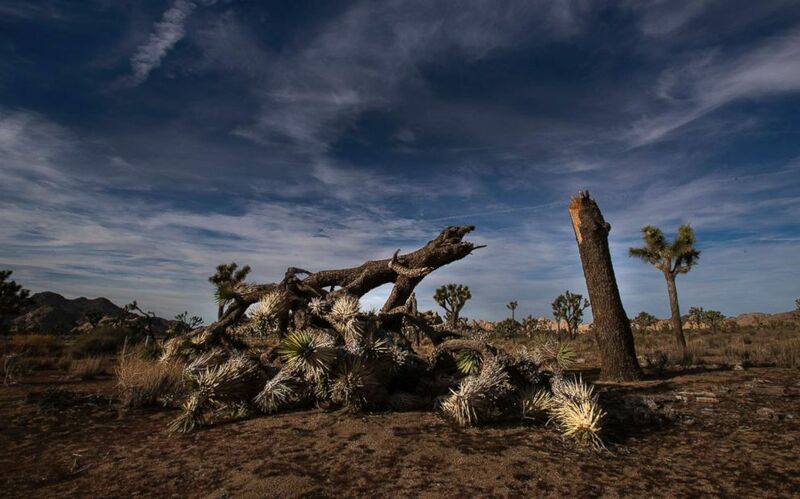 National parks are being impacted by the shutdown, and some damage was reported in Joshua Tree National Park in California amid the shutdown. (Gina Ferazzi/Los Angeles Times via Polaris) A once vibrant Joshua Tree has been severed in half in an act of vandalism in Joshua Tree National Park on Jan. 8, 2019, in Joshua Tree, Calif.
Two restaurants and local authorities are helping furloughed federal workers in the Wabash Valley region by giving them some free meal options and assistance in paying their bills during the government shutdown. The Chick-Fil-A in Terre Haute, Indiana, is offering a free chicken sandwich or eight-piece chicken nuggets to federal prison workers, reports ABC affiliate WAWV. "The people that this really impacts, it's our guests, it's our community, it's the friends that we see everyday, so this is just one way that we can do what we can to help out a little bit," said Evan Williamson, the owner of the Chik-Fil-A in Terre Haute, told the station. If chicken isn't their ideal choice, local restaurant called Fazoli's is offering free pizza baked spaghetti for impacted workers. The mayor of Brazil, Indiana, announced that furloughed workers won't have to pay late fees on their utility bills, and local provider Duke Energy is working with impacted federal employees to create financial assistance programs, WAWV reports. The people that this really impacts, it's our guests, it's our community, it's the friends that we see everyday, so this is just one way that we can do what we can to help out a little bit. The Nevada System of Higher Education got a personal appeal from Gov. Steve Sisolak asking them to work with students whose college tuition payments may be impacted by the shutdown, reports ABC affiliate KTNV. Sisolak wrote a letter to the chairman and chancellor of the schools system, noting how "many are struggling to pay for basic necessities, including food and rent, and of the fundamental expenses necessary to support themselves and their children. For many families, these expenses include college tuition." He called for them to work to find "a temporary solution" for any tuition troubles. "These students will be expected to pay the costs of their education, as originally planned before this period of uncertainty at the federal level," he wrote. "But I hope that our institutions can offer financial assistance to our students who indicate that they will otherwise need to withdraw from courses this semester due to these unforeseen circumstances."